Vine Cottage01263 715779work01603 870304fax Self-catering A pretty, thatched, single storey cottage, which is one of three sister cottages that can be booked separately or together. This stylish cottage has a lovely open plan living area with French doors that lead out into the enclosed garden, perfect for you and your four-legged friend who is welcome at this cottage too so that everyone can enjoy a relaxing holiday. 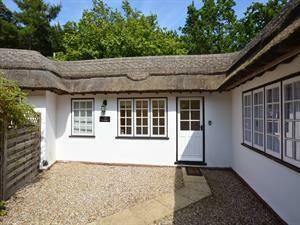 A pretty, thatched, single storey cottage, which is one of three sister cottages that can be booked separately or together. This stylish cottage has a lovely open plan living area with French doors that lead out into the enclosed garden, perfect for you and your four-legged friend who is welcome at this cottage too so that everyone can enjoy a relaxing holiday.